The astro compass is not a sun compass, but it too is an instrument which is used for finding one's position thanks to the sun, moon or stars. This instrument was used by the Royal Air Force during the Second World War. All the information below is extracts from an instruction manual on air navigation, dating from 1941, which was supplied to me by the Imperial War Museum in London. The photos above were kindly supplied by Bill Walton of Plymouth (USA). 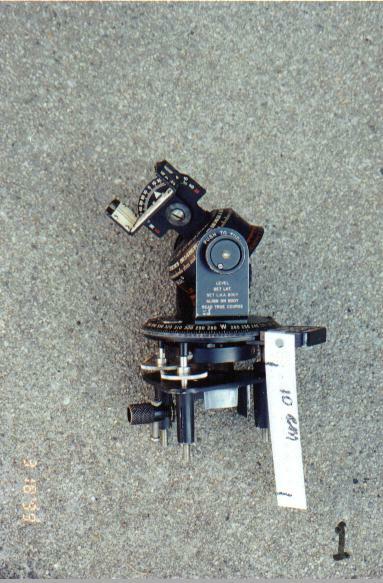 The astro-compass consists of a bearing plate (1) with a movable sighting device (2) attached to it. 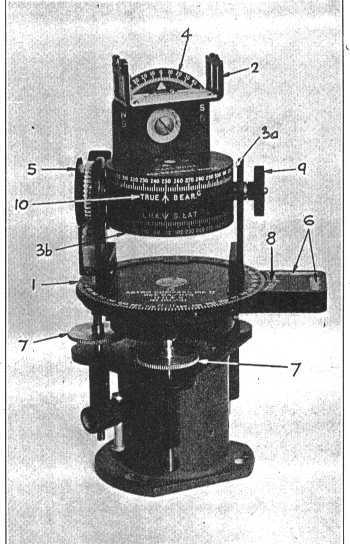 The sighting device is set relative to the bearing plate so that the angle between its line of sight and a north mark on the plate is equal to the azimuth of an observed heavenly body. - The local hour angle of the body (3). - The latitude of the observer (5). The instrument is so constructed that when these values are set on the astro-compass (the scale for each being clearly marked), and the sighting device is aligned on the body, the bearing plate will be properly oriented and the north-mark upon it will indicate true north. 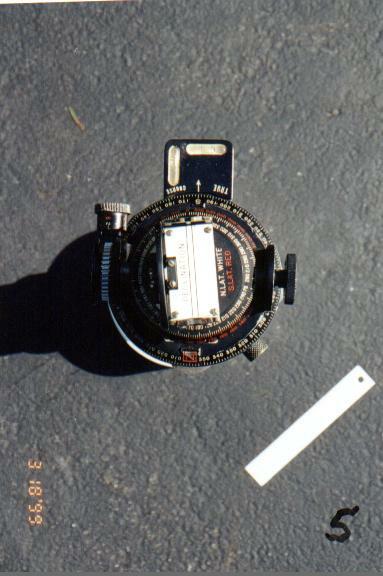 The astro-compass may be levelled by means of cross-levels (6) and adjusting screws (7). Its base consists of a bearing plate (1), free to rotate against a lubber line (8). Two graduated hour angle scales are mounted above, one in white (3a) for north latitudes and one in red (3b) for south latitudes. These scales are locked together and are rotated by a spring-loaded knob (9). 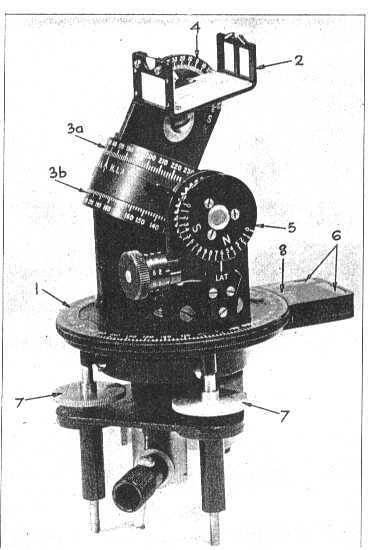 Attached to the top of the hour angle scales is a sighting device (2), which has a shadow bar and screen for use with the Sun or Moon and a prismatic str-sight for use on other occasions. 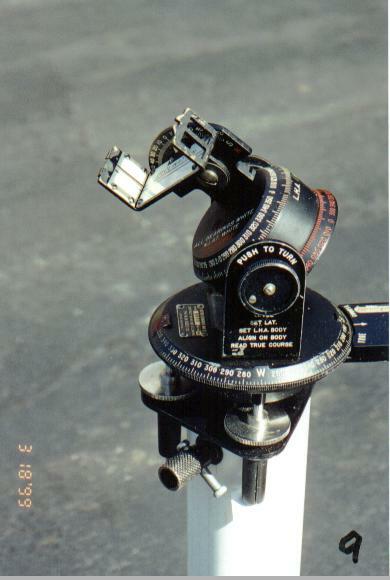 Although aligned permanently with the 0°-180° line of the hour angle scales, the sights can be tilted for any declination between 64° N or S. The declination is read against an arc (4), engraved in white (for north latitudes) or red (for south latitudes). The latitude scale (5), white for north and red for south, is adjusted by a knob that indicates single degrees to be added to the tens of degrees marked on the scale itself. When usig the Sun or a bright Moon, the bearing plate is rotated until the shadow from the shadow bar falls between the parallel lines on the shadow screen. 1- It provides a rapid check on the true course. 2- It enables a required course to be steered independently of the magnetic compass. 3- It can be used for taking accurate visual bearings. When using heavenly bodies, those having low altitudes give the most accurate results, particularly in low latitudes. 1- Place the instrument in its standard and level each bubble in turn with the appropriate screw. 2- Set the latitude (nearest degree). 4- Set L.H.A. on the appopriate hour angle scale. 6- Rotate the bearing plate until the sights are aligned on the body. 7- Read the true course of the aircraft against the lubber line. 1- Set the true course required against the bearing plate lubber line. 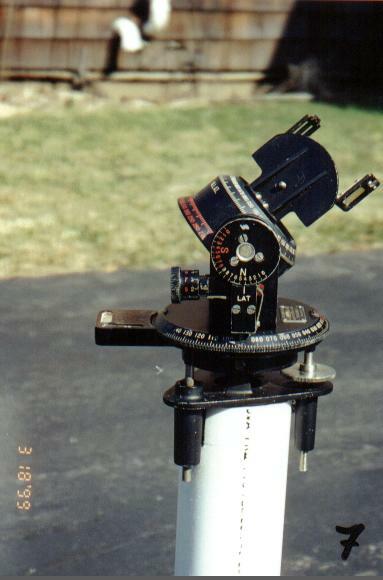 2- Set up the instrument for latitude, declination and hour angle as described above, and level. 3- Instruct the pilot to turn the aircraft until the selected body comes on to the sights. 4- Maintain the course by the directional gyro. 5- Check course with the astro-compass at intervals of not more 15 minutes, altering the course steered on the directional gyro if necessary. 1- Place the instrument in its standard and level. 2- Rotate the bearing plate until the true course registers against the lubber line. 4- Turn the hour angle scale and adjust the declination scale until the star is on the sights. 5- Read off the L.H.A star and the declination. 6- Calculate the S.H.A. star.